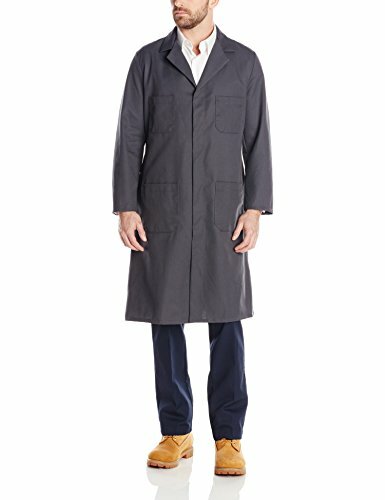 Red Kap Men's Shop Coat Look sharp around the shop with the four-pocket shop coat. The longer length and concealed gripper front keep dirt and grime off while you're on the job. LONG LENGTH PROTECTION. 43 1⁄2" length provides barrier between your clothes and grease. DESIGNED WITH PRIDE. DONE RIGHT. Join the 16 million American workers who go to work wearing Red Kap. WRINKLE FREE. Wrinkle-resistant finish for minimal ironing and keeps you looking professional all day. ZERO SCRATCH. Paint jobs and surfaces stay scratch free thanks to strategically-designed garment features that keep buttons and snaps under wraps. FOUR POCKETS. With two chest pockets with a pencil stall on the left and two lower pockets you will have plenty of storage. If you have any questions about this product by Red Kap, contact us by completing and submitting the form below. If you are looking for a specif part number, please include it with your message.